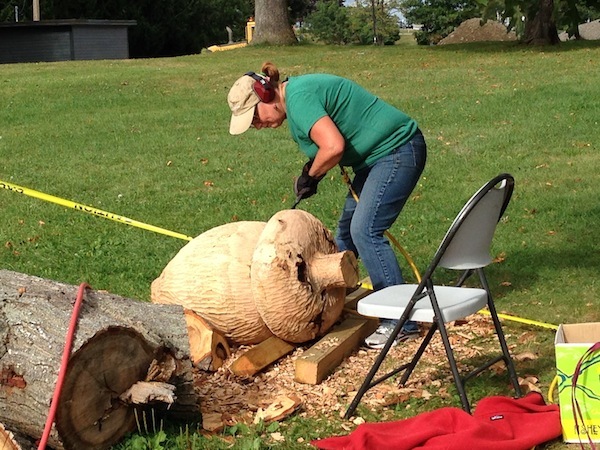 If you’ve strolled by the Castle in Deering Oaks recently, you might have noticed a woman with power tools carving a fairly good-sized piece of oak. 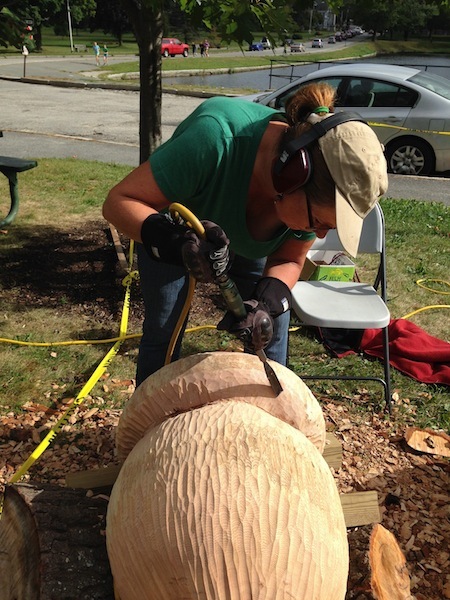 That would be Anne Alexander, a sculptor from South Windham, and she’s carving a giant acorn. Anne is my first subject in a series of artist’s profiles I’ll be writing for the mylatestart blog. 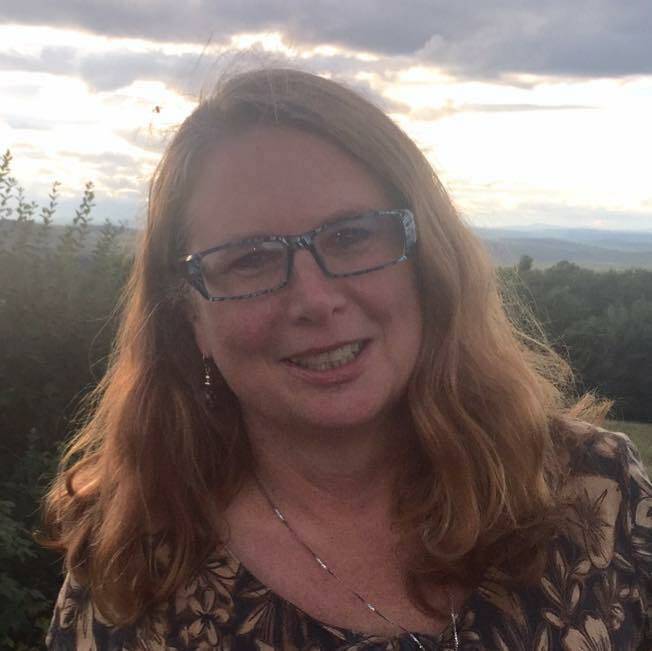 My intention is to find out what inspires individual artists in Maine and how they bring their visions/ideas to life. I’ll also ask each to share a bit of artistic wisdom and advice. And, of course, I’ll include lots of pictures of their work and a link to their websites so you can see more. So … let’s begin with Anne. In the second grade, I did a drawing of a squirrel in crayon. We went out to recess and when we came back in the teacher had put it up on the board. All the kids asked who did that and they thought it was really good. The teacher said Ann did it, and ever since I knew I was going to be an artist! 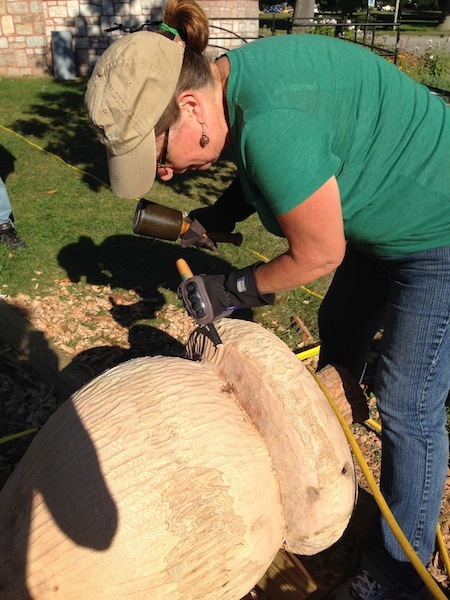 And here I am, carving a giant acorn when I’m 57 years old! When did you decide to become a sculptor? I realized I was a sculptor my junior year of college. My painting teacher suggested I drop painting class to focus on sculpture because all my paintings were sculpture ideas and I had no interest in dealing with the background. I work in clay, wood and stone (alabaster, marble, granite). For a while, I won’t do anything in wood and I’ll just be working in clay and then, for a while I’ll focus on alabaster — carving the soft stone of alabaster. I’m a Gemini. I like to do this and that. I look at small parts of nature, like seed pods and shells and insects —minute things — and then I make them large. I’m playing with scale, which a lot of sculptors do. I work with scale in relation to the human body. I want people to look at nature in a new way after seeing my work. 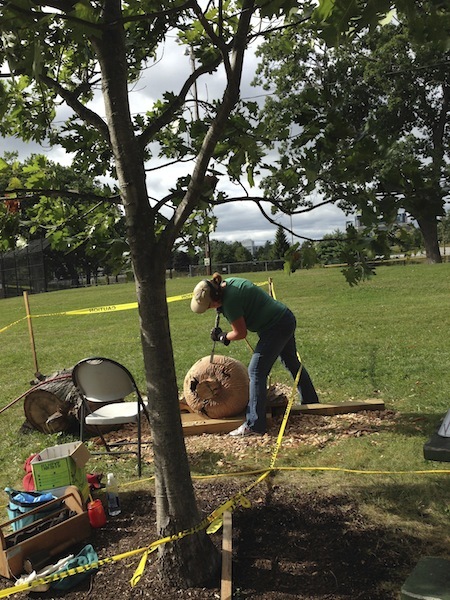 What motivated you to carve a giant acorn? 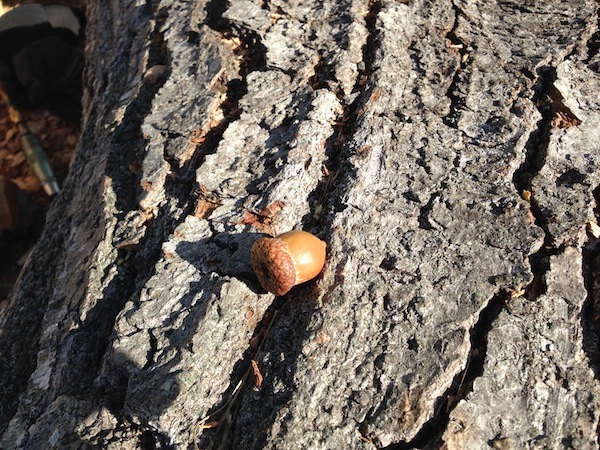 I carved an acorn one other time, in Elm Park in Worcester. That was the most public I’ve ever worked and people were fascinated. They wandered along from all walks of life and some would return every day I was working. It was great to have people really see how a sculptor works. I’d been thinking about an acorn in Deering Oaks. The trees here are mostly oaks, majestic oaks. I presented my proposal to the City and they said yes, we’re so into it, but we have no money, so I applied to the Maine Arts Commission for a project grant. What has been your process carving the acorn? 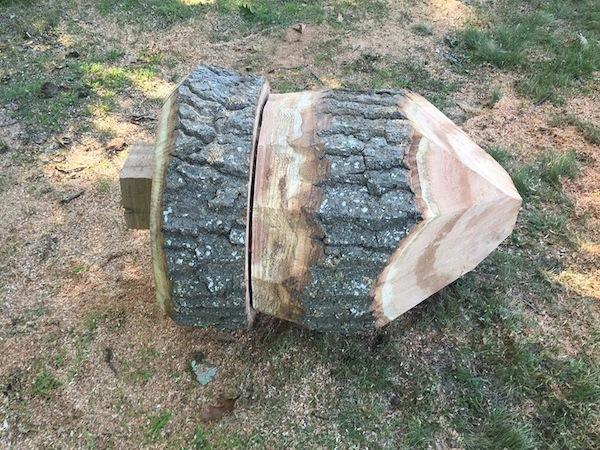 First, I sent an email to Jeff Tarling, the city arborist, saying I want to carve a giant acorn, do you have any big oak logs. He replied that there was one in the arboretum at Payson Park. I never knew there was an arboretum in Payson Park. It’s really cool. When I saw it, I liked it. A man named Charlie roughed it out for me with a chainsaw. I drew it out in chalk and directed him where to cut. I like to say the only time you can go too far is with the chainsaw or with the rough cuts. After that, it’s very slow. You just take it away a little bit at a time. I used a chainsaw to take off the big pieces and now I’m using a regular wood chisel that I put it into a wood chisel adapter that goes into a pneumatic gouge. I’m also going to use hand chisels. I’m going to do the detail with hand tools. Carving is my favorite part of the process. I love the carving. Yesterday, I worked a long day — from nine to five. I did take a lunch break and fell asleep on the grass for ten minutes and then I was good to go. It’s so exciting when you’re carving, it really is. It’s meditative and it’s fun and you keep looking at the next part that has to come down. My acorn is probably more rounded, but I like that. It’s being changed somewhat and part of it is that the form kind of draws me along. I really believe the form comes from my center and from my body. My work is about the body and nature — that connection. The size of it makes it a lot of work. I am definitely doing physical labor with this piece. My arms get tired and I have to shake out my hands. Using the air compressor, you can’t do it forever. I stop every ten minutes — for me and also to let my air compressor cool down. It’s a lot easier than doing it by hand. Oak is hard to carve by hand. 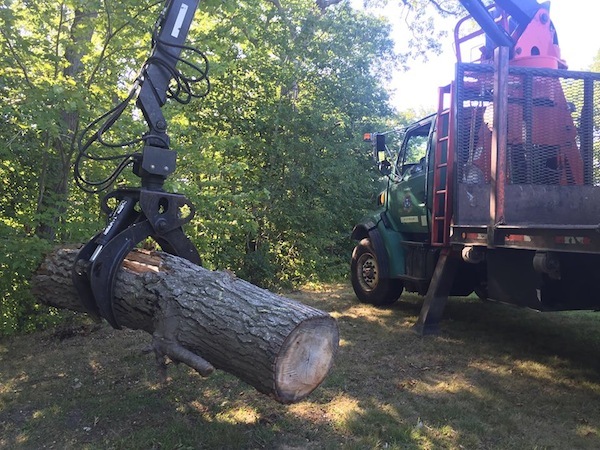 It’s one of the harder woods, but it will last outdoors longer for that reason. Because it’s a green log, I’ll need to wait at least two years before I put any finish on it, otherwise it would seal in the moisture. What will happen to the acorn when you’re done? It’s going to be in Deering Oaks until June first, 2016 and after that, I don’t know. I want kids to play on it and then I would love to sell it, so I could make more acorns! It could go to another outdoor site sculpture show, which I do a lot of or maybe someone will buy it. Maybe the park will buy it! Do you have any words of wisdom for beginning artists? I think it’s most important to just do the work. For me personally, I have to make sculpture— it comes from my center. I figured out later on the meaning behind my art. Be true to yourself and truly and deeply explore what interests you. Look at art in galleries, museums, online, books, etc. Where can you see more works by Anne Alexander? You can learn more about Anne and her sculptures on her website Anne Alexander Sculptor. I”m glad you like it, Anne! I just changed the title of the post to reflect the title of your piece. Send me a picture when it’s done and I’ll share it with everybody. this another inspiring story, that if you want to learn anything, the world is your oyster. Sculpture, is one thing that I’ve always admired, but never dreamed of doing. When I was a kid, I used to whittled, with a pocket knife, actually, everryone did. 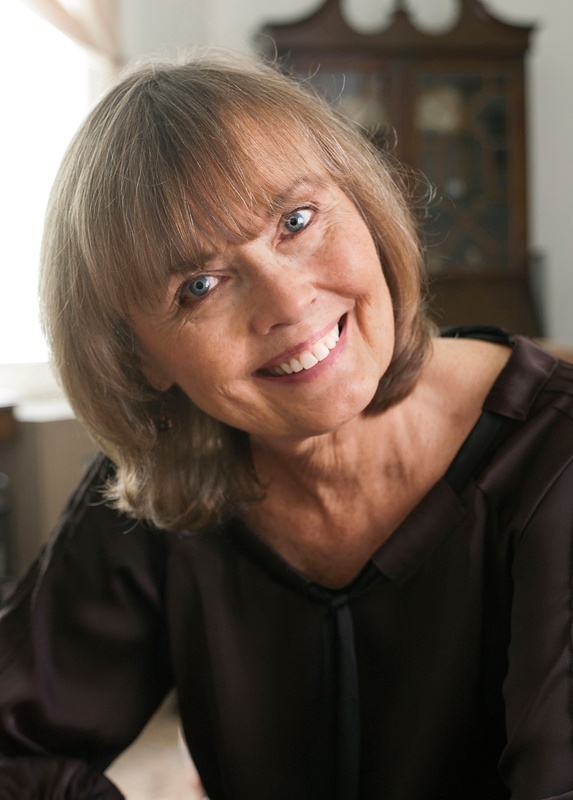 On a grand scale no way – so I say Hurray to you Ann Alexander! 99.9 % of the time your dreams and intuition, is God pushing you in that direction!